My first impression of Dr. Steve Gallon III was hearing about how cool of principal he was from my friends who attended Miami Northwestern Senior High school. This was back in 2004. They described him as a cool young principal who helped make their high school experience some of the best times of their life. Although, it wasn’t until more than 10 years later when I finally had chance to meet Mr. Gallon, his reputation of being a great educator and pillar in the community always reached my ears. So when I heard that he was throwing his hat in the race for the District 1 school board seat, I naturally thought he was a good man for the job. And quiet as it’s kept, his opponent and current school board member, Wilbert T. Holloway, hasn’t done anything amazing that showed me he should keep this job. The schools are failing in District 1. I know this for a fact because I’m a product of those schools and I’ve volunteered at some of these schools after graduating. I’ve attended schools in Miami Gardens and Liberty City and when compared to my counterparts at schools like Coral Reef, Miami Lakes Tech and MAST Academy, my experienced differed greatly from theirs. The facility, the resources and education they received (although we all go to school in the same county) was different from mine. They had more, simply put. And my hat is off to the hardworking faculty of District 1 schools because you all do a lot with little. Mr. Holloway could have done more to advocate for the school’s in his district. He hasn’t and it’s time for a change. We thank you for your service but I trust that Gallon can do better. I think L.I.F.E Collective member, James Mungin II, said it best with this Facebook post about a debate Gallon and Holloway attended that was hosted by the Miami Times last week. What he said is mentioned below. Mr. Mungin said that perfectly. We want better and the black and brown students in District 1 deserve it. 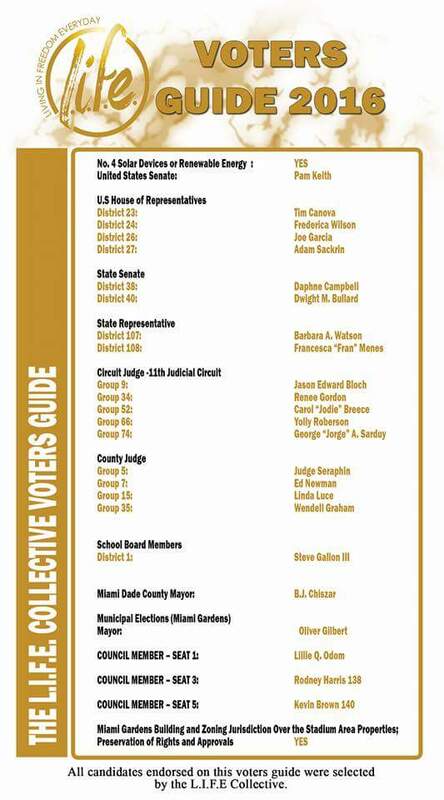 Remember to vote for Dr. Steve Gallon III for Miami-Dade School board seat for District 1. Election day is August 30, 2016; however, early voting runs now through August 28th.